Introducing Curvy Cut Tees. These are tees for women that start at size 14 and go up to size 28. No longer do women of larger sizes need to worry about squeezing into a tapered standard cut tee. This is truly revolutionary because now when you order custom tees for an event or cause, every one can get a custom t-shirt that fits them comfortably. Curvy cut tees are just the beginning to cater to women of larger sizes. This tee has just been introduced and chances are if history remains the same, more styles and colors will be added next year. Right now they are limited to very basic colors although they come in a range of styles from scoop neck, v-neck, tank, baseball tee, and long sleeve. The curvy cut tees are made out of 100% combed ring spun cotton so they are soft and great for screen printing. From a screen printers perspective you can order more traditional tees with your order and should you need a curvy cut tee for a few women that is not a problem. You can mix and match standard style tees with curvy cut tees as it makes no difference to us. 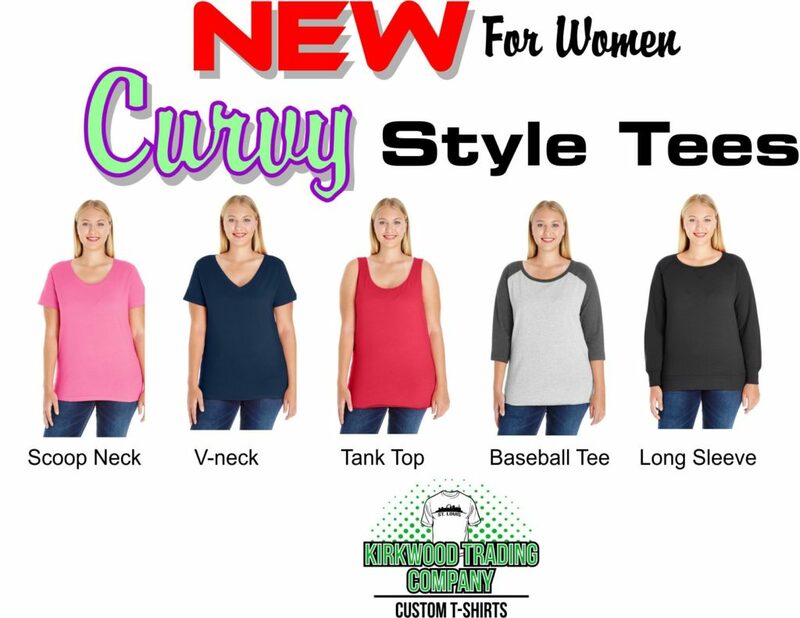 Current color availability on the curvy cut tees are black, white, pink, navy, red, and grey. What is nice about this offering is that is spands several styles. Typically when a product is introduced the styles are very limited but in this case there is just about every major style covered. So it’s obvious this offering is in response to demand which is great. Women of all sizes can now enjoy having access to a shirt that truly fits their body type. If you’d like a quote on custom printed curvy cut tees, just contact us under the contact us page and we’ll be happy to put pricing together for your custom t-shirt screen printing needs.